SUNFIX for Judy is a sculpture that marks the passing of the equinox, which occurs during the third week in September and March. 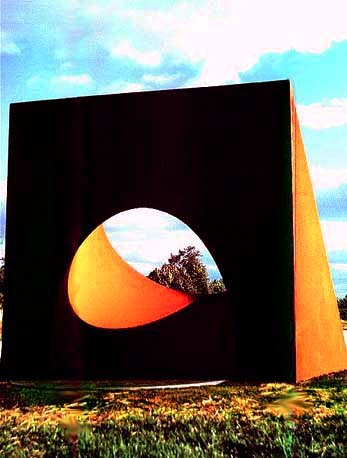 At that time, at the 45 degree north latitude site of the sculpture, the sun's rays pass through the interior tunnel of the sculpture causing a sunspot that covers the elliptical pice of black marble on the ground to the north. At other times of the years the sunspot will appear shortened or elongated. "Judy" mentioned in the title of the piece refers to Judith Brown, a friend and fellow sculptor whose creative energy and artwork inspired Pond. Judith Brown died of cancer in 1992. Kate Pond has been studying ancient stone work and alignment pieces worldwide, which has led her, in part, to complete sculptues in Norway nad Quebec. She is planning additional sculptural sites in Hawaii, Japan and Australia to continue the passings of the season themes. Kate Pond was born in 1938 in Waterville, Maine, and she has family roots in Franklin County, Vermont. She has earned a Bachelor of Science degree from Skidmore College, Saratoga Springs, New York. Pond currnetly lives in Burlington and has taught art for the last ten years. Pond's commissions include the Norwegian Museum of Science and Technology, Oslo, Norway; Colby-Curtis Museum, Stanstead, Quebec, Canada; International Sculpture Symposium, Burlington, VT; Shelburne Town Hall, Shelburne,VT; Johnson State College Campus Sundial, Johnson, VT; Winooski Falls Park, Winooski, VT; Fletcher Free Library, Burlington, VT; Holocaust Memorial Allied Jewish Center, Montreal, Canada. Kate Pond's sculptures have been exhibited at the Brattleboro Museum and Art Center, Brattleboro, VT; Johnson State College, Johnson, VT; Vermont College Arts Center, Montpelier,VT; Govenor's Corridor, Pavillion Office Building, Montpelier,VT; Windsor State Craft Center, Windsor,VT; Royal Tyler Theater, Burlington, VT; Skidmore College,Saratoga Springs, NY; Castleton State College, Castleton, VT; Wood Art Gallery, Montpelier, VT; Christ Episcopal Church, Montpelier,VT.